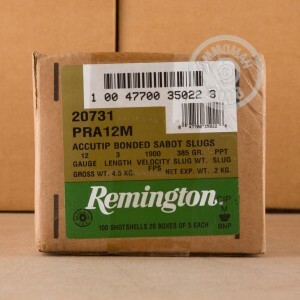 These 12 gauge rounds, by Remington, are designed to be fired from shotguns with rifled barrels. 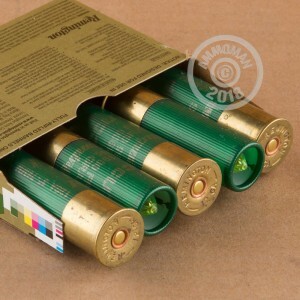 Each round contains a 385 grain bonded sabot slug, in a 3 inch shell. These rounds leave your barrel at a muzzle velocity of 1900 feet per second, and contain a polymer tipped projectile. The AccuTip slug has great accuracy out to about 200 yards, and it will have explosive expansion when you hit your target. These slugs can easily take down any game native to North America. 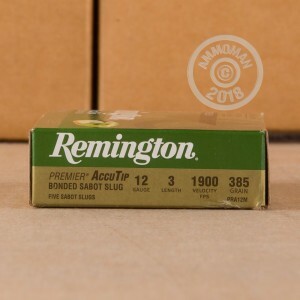 Remington is one of the largest manufacturers of ammunition in the United States. They produce a wide variety of ammo, and they have just about anything a gun owner would need. These shells are manufactured in Lonoke, Arkansas. Severe recoil, target devastation, maximizes range, accurate. I like them.